The Wham-O toy company made an all-inclusive fallout shelter kit. I do not remember our school having any bomb drills but we did have fire drills! I suppose the main reason they were not held was that we were less than 100 miles away from military targets...there was an air force base and quite a few Minuteman missile sites nearby! And during the Cuban Missel Crisis, the schools started to have drills again. We all go to the schools basement and sit on the floor against the wall with our head between our legs. 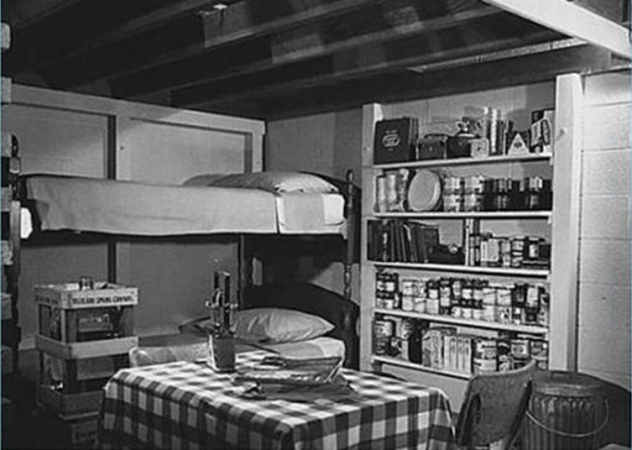 I remember my father designing a bomb shelter, still remember the plan, the walls, the so-called barriers for the several kinds of radiation...at school we were told to hide under our desks...this was the height of the Cold War, early '50's...idiots! It was far worse than we knew, still is, oh duh, and who warned us? Look it up! None are safe as it is, but water goes downhill, tides go in and out, drill deep, not for oil but geothermal, only vapor/steam, wind blows, sun shines, fusion not fission. Just saying! I'm old, not dumb!